Last Day at work! - Time for a nice cup of tea? So, I survived my last day at work and it was not as hard as I feared! 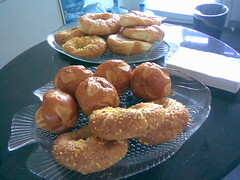 I brought in lots of croissants and sweet pastries for the Business School teams on our floor. I cleared my inbox, my pending emails, my to do list, threw out lots of paper, gave some last minute instructions regarding courses next week and did the last couple of tasks that I have been putting off for weeks. My desk was clear and finally there was nothing left to do. Left at about 6pm. I had lunch with a new friend Meera, a pregnant friend I met at the weekend birth preparation course. So that's it - I'm on full time Mummy duty for 6 months!! So this makes me laugh, in a bittersweet way. I was actually doing work from home while having contractions! So I literally had only about 12 hours of maternity leave before baby arrived in the world!